CELEBRATION, Fla. — Junior Bassmasters, ages 11 to 14 and 15 to 18, will compete against each other within their age groups Saturday, Nov. 5, 2011, on Bayou DeSiard out of Monroe, La., for the 2011 Bassmaster Junior World Championship. The competition is scheduled to coincide with the B.A.S.S. Federation Nation Championship presented by Yamaha and Skeeter Boats. Six competitors from each of the two age groups will vie for bragging rights, and all participants will receive scholarships to be used for education, with amounts determined by their finish. Six brand-new Yamaha and Skeeter boat rigs — which will be driven by adult B.A.S.S. Federation Nation volunteers — will be provided for the championship. Federation Nation volunteers are not permitted to provide any information to the young anglers; they can observe and drive only. Young anglers advance through a number of qualifying rounds on the local, state and divisional levels to qualify for the Bassmaster Junior World Championship. Competitors are paired according to the divisions from which they qualified. The Junior Bassmaster program was formed in 1983. Participants learn about conservation, natural resources, fishing and competition. Currently, 183 Junior Bassmaster clubs exist in 47 states, Canada, Zimbabwe and South Africa. Junior Bassmaster tournaments are administered by state/provincial B.A.S.S. Federation Nation chapters. The 2011 B.A.S.S. Federation Nation Championship presented by Yamaha and Skeeter Boats will take place on the Ouachita River out of Monroe, La., Nov. 3-5, 2011. Live, streaming video of the weigh-ins is included in the wire-to-wire coverage of the championship on Bassmaster.com. 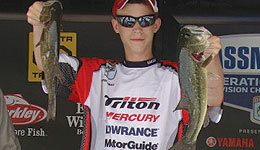 To learn more about the Junior Bassmaster program, visit www.bassmaster.com/youth. For more information about the B.A.S.S. Federation Nation, go to www.bassmaster.com/federation-series. * License: All anglers ages 16 and older are required by the state of Louisiana to hold a fishing license. * Launch: Boats will launch at 7:15 a.m. CT from Bayou Desiard Country Club Ramp, 3501 Forsythe Ave., Monroe, LA 71201. * Check-in: Junior Bassmasters will check in at 2:15 p.m. CT, and then weigh their fish on the B.A.S.S. Federation Nation main stage, Forsythe Boat Dock, 2201 Riverside Drive, Monroe, LA 71201. * No cost: All events are free and open to the public.